The Mantegnesque phase of Bellini's art comprises several fundamental paintings . Included among them is the Crucifixion, formerly in the Venetian church of San Salvador and now at the Museo Correr in Venice, whose chronological placing before or after the Transfiguration in the same museum has been a matter of some uncertainty. Certainly the anguished forms and the meticulous arrangement of the elements are characteristics that appear extremely early in Bellini's career, and for this reason the period between 1455 and 1460, coinciding with the presence of Mantegna in Venice, seems the most plausible moment for its execution. The landscape, though vast and expanded, is not yet conceived as a whole, but built up piece by piece according to an intellectual model filtered through the Gothic experiences of Jacopo. 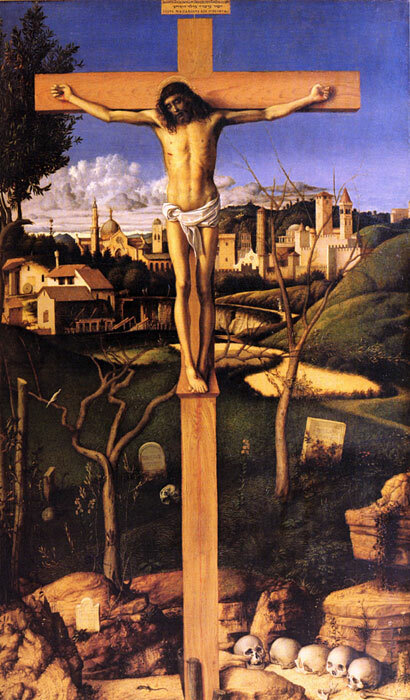 The figures in The Crucifixion by Bellini are slender and sharply defined, and their grief, sculpted with raw pathos in the half-open mouths and extreme boniness of the bodies, is echoed in the stony contours of the landscape. These features had led some scholars in the 19th century to ascribe the painting to the Ferrarese artist Ercole de' Roberti.